Kim Cascone does great things with Csound and Max/MSP, as his ever-questing mind takes him deeper inside the genre of electronic composition known as "microsound". I first took note of "Blue Cube" a demo found with the Csound programme. 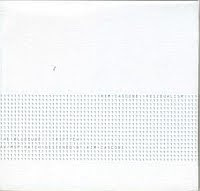 Coincidentally I heard the 1998 release of the same name on Raster-Noton and was amazed that a software demo could be an album track. And why not? The trilogy that started with that CD continued with "Cathode Flower" and concludes with "Residualism" from 2002 (on Ritornell). This is something of a remix album, shattering material presented in the previous releases. We have here the familiar sounds of granular synthesis and ring modulation, time-shaped filtering and swept EQ. While not as distinctive or interesting over the long-term as the previous releases, it nonetheless provides a listenable experience. Visit his website, Anechoic Media. To clarify: Buy his earlier two albums mentioned in chronological order before you get to this one.